I’m indebted to Ian Hardy, of Great Yarmouth Borough Council, for prompting me to seek out the former Regent Theatre on Regent Street, now Mecca Bingo. Tracy Utting, the Manager, was very willing to allow my Norfolk’s Seaside Heritage tour-group to visit before the club opened, and her colleague Kerry took great trouble to show us as much as possible of the historic parts of the building. The Regent has a sophisticated classical façade, with huge Ionic columns and a Diocletian window; within is an impressive staircase, now altered, the former café with an extensive plaster frieze of putti and garlands, and the auditorium is decorated with rococo plasterwork, with boxes supported by cast-iron columns. 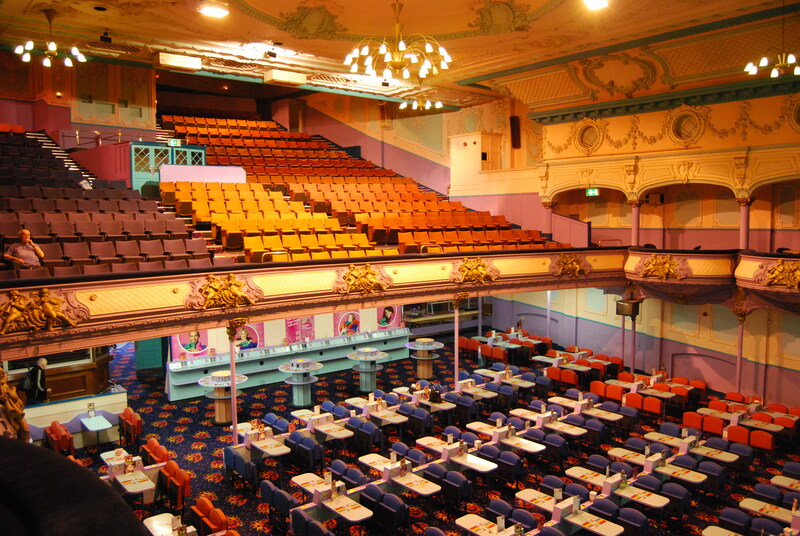 It was built in 1914 for Francis Holmes Cooper, a Wisbech estate-agent who owned a chain of theatres and cinemas across East Anglia, most if not all of them designed, like the Yarmouth Regent, by Francis Burdett Ward. It closed as a cinema in September 1982, and ever since has operated as a bingo club. The bingo industry has proved a magnificent custodian for so much of Britain’s entertainment heritage. From the Blackpool Grand Theatre to the Wakefield Opera House, from the Grade I Tooting Granada Cinema in South London, still operating as a bingo club, to the magnificently restored Stockport Plaza Cinema – any or all of these might not have survived without the proceeds of bingo to keep the building going. Kerry, as she showed us everywhere from the boxes to the basement (still containing an industrial-sized stove for the café above), remarked that very few people other than club members ever set foot in the building. Yarmouth people may have forgotten it exists. If and when the bingo moves on, the Regent will need a new purpose. It’s too good to lose. Mecca closed their operation at the Regent “at the end of 2011”. It reopens as Stars Showbar and Nightclub in April 2014: http://starsgy.co.uk. This entry was posted in Fun Palaces, Norfolk's Seaside Heritage on January 4, 2014 by Mike Higginbottom. The Hollywood Cinema on Great Yarmouth’s seafront commemorates a time when local businessmen hoped to make money out of people watching fish. 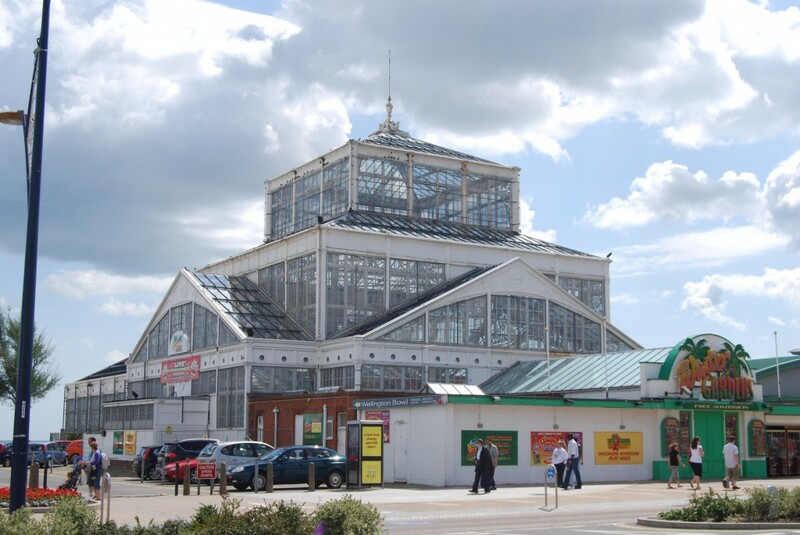 Yarmouth entrepreneurs hoped to build on the success of the Brighton Aquarium of 1872 by offering “aquaria exhibitions, combined with attractions of a more special and amusing nature” which meant restaurants, billiard rooms, croquet lawns and a skating rink in what a modern journalist described as “a grotesque mock Gothic cathedral of leisure”. Perhaps unsurprisingly, less than half the required £50,000 capital was forthcoming, and the London promoters of the Great Yarmouth & Eastern Counties Aquarium Company pulled out, leaving local shareholders to lower their sights and open a more modest facility which failed to attract visitors. A contemporary commented that “wretched management was not an unimportant factor”: the magistrates’ refusal of a drama licence was unhelpful; apart from watching the fish which – to be fair – included sharks, giant crabs, conger eels, turtles, porpoises and octopi, with crocodiles, alligators and seals in large ponds, the entertainments on offer were the skating rink, military bands, refreshments and a reading room. The Prince of Wales visited in 1881. The place closed down in 1882. The building reopened as the Royal Aquarium, extended at the cost of a further £10,000, in 1883. The major asset of the reopened building was its new manager, an Edgware Road caterer, John William Nightingale. He engaged such crowd-pulling celebrities as Sir Ernest Shackleton, Oscar Wilde, General William Booth and David Lloyd George. There’s clearly limited demand for gazing at fish. 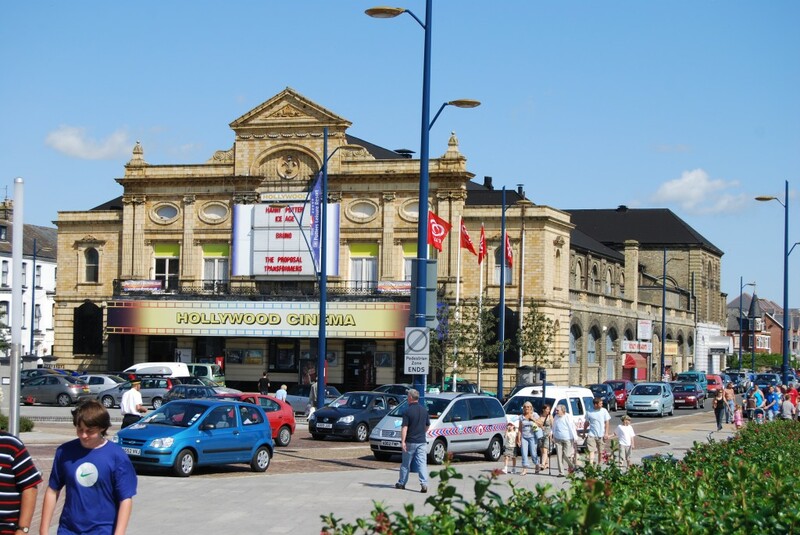 The Scarborough People’s Palace & Aquarium of 1875-7 [see Scarborough’s Rotunda] ultimately became an amusement arcade. J W Nightingale became a power in the Great Yarmouth entertainment industry: by the time of his death in 1911, he had purchased the Royal Aquarium, bought and replaced the old wooden Britannia Pier and also owned the Theatre Royal, the Royal Assembly Rooms and the Royal and Victoria Hotels. In 1925 the Aquarium tanks were stripped out and a second “Little Theatre” auditorium added. In a further refurbishment in 1970, the remaining evidence of the original Aquarium decoration briefly came to light. In what had been the Grand Saloon, 193 feet by 60 feet, Doulton tiling depicting freshwater birds on one side and sea-birds on the other was found in situ, and a bread-oven was discovered in the basement, extending thirty feet under Euston Road. When I ran the Norfolk’s Seaside Heritage tour in September 2011 I asked the manager, Paul Allen, if there was any possibility of seeing these remains. Understandably he was disinclined to rip up the floorboards on a Saturday morning. One day in the future, when this long-lived building is adapted to yet another use, vestigial remains of its original purpose will once again see daylight. As you drive along the tortuous coast road through the Poppyland area of north Norfolk, after passing through Overstrand, Sidestrand and Trimingham you may notice on the horizon two large Victorian hotels looming incongruously over the landscape. This is Mundesley, a former fishing village that was aggrandised into a resort in the mid-1890s as the railway at last penetrated to this remote corner. The station opened as the terminus of a line from North Walsham in 1898. In 1908 it was extended through to Cromer Beach. Its three platforms, each six hundred feet long, were never remotely necessary. It closed in 1964 and is now virtually obliterated. The East Coast Estates Company was established in the 1890s by an architect with the unfortunate name of Mr Silley. Streets were laid out on the West Cliff and given the name Cliftonville. Two brickworks opened. The Clarence Hotel (1891), which is now a care home, and the Grand Hotel (Herbert John Green 1897), which is apparently being converted to apartments, stare out to sea, grandiose statements of opulence and unfulfilled ambition. 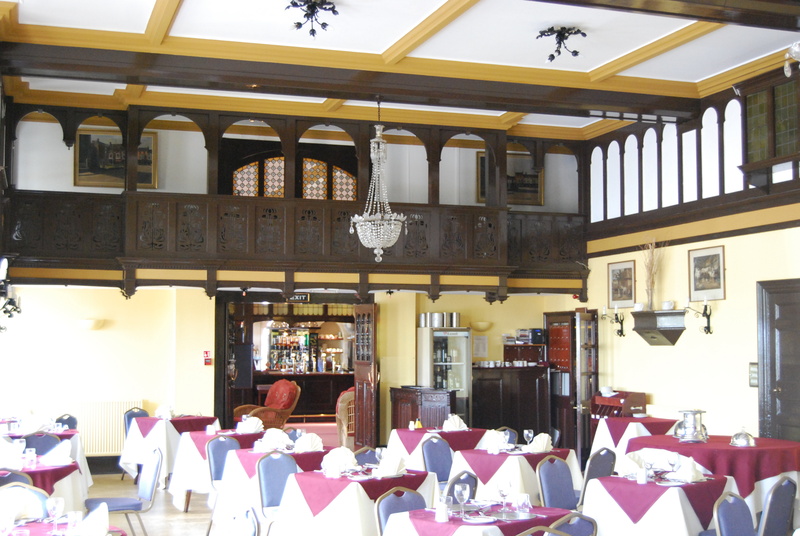 The Manor Hotel, built around an earlier dwelling to a design by John Bond Pearce in 1900, remains in business – http://www.manorhotelmundesley.co.uk. 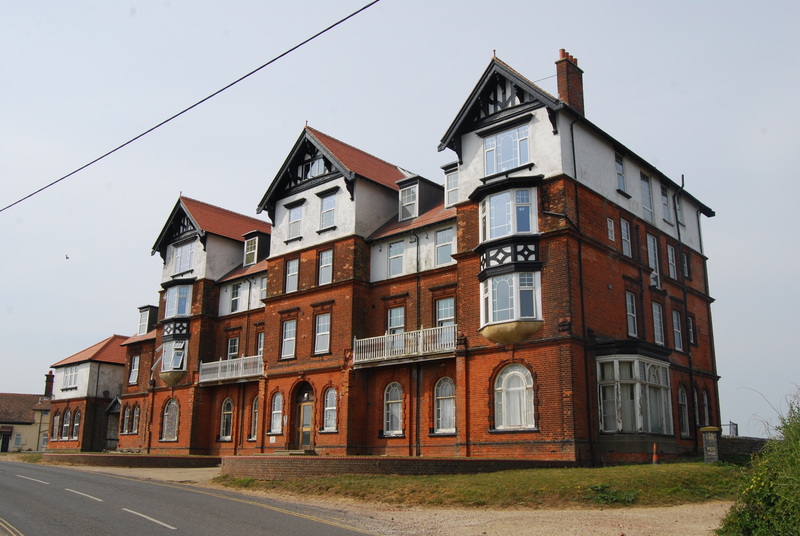 Indeed, the most successful enterprise in Mundesley was the Sanatorium, opened in 1899 with an initial capacity of twelve patients, a fine timber prefabricated building by the Norwich architects Boulton & Paul. This became the Diana Princess of Wales Treatment Centre for Drug and Alcohol Problems in 1997 and closed in 2009: see http://www.derelictplaces.co.uk/main/showthread.php?t=18049, which links to http://www.derelictplaces.co.uk/main/showthread.php?p=182326#post182326. One of its early patients was the golfer Harry Vardon (1870-1937), who laid out the Mundesley Golf Club [http://www.mundesleygolfclub.com] in 1901. He was treated for tuberculosis in the Mundesley Sanatorium in 1903-4, during which time he achieved the only hole-in-one in his entire career. Of the holiday towns along the Norfolk coast, Mundesley really is the last resort. Though the population of this quiet place has continued to grow through the twentieth century, the visitors were always thin on the ground. That’s its unique selling point. It has a beautiful beach, beach huts, a quiet village atmosphere. It’s the ideal place for an away-from-it-all British seaside holiday. No tat. No razzamatazz. The real thing. Enjoy! This entry was posted in Fun Palaces, Life-enhancing experiences, Norfolk's Seaside Heritage, Victorian Architecture on December 29, 2013 by Mike Higginbottom. I’ve stayed twice at the Cliftonville Hotel, Cromer [http://www.cliftonvillehotel.co.uk], so I’ve observed the architecture at close quarters over a full English breakfast. The dining room is an impressive example of the exuberance of the Norwich architect, George Skipper, but the archaeology of the building is odd. According to the material I surfed in the local-studies section of Cromer Library, a local retailer, William Churchyard, built a residence designed by A F Scott in 1894 on the site of Skipper’s later extension. This was a dignified Victorian villa which looks on the only photograph I could find quite different to the existing hotel. Within a couple of years Churchyard had the elaborate corner building constructed by an unknown architect, and then appears to have demolished the house and replaced it by Skipper’s elaborate wing of 1898, which includes a grand staircase, a ballroom and an elegant dining room with a minstrel’s gallery. Why would someone knock down a four-year-old house to extend a hotel over the site? I could find no clear indication of a domestic structure lurking within the shell of Skipper’s 1898 work. The rooms and floor-levels are entirely logical for a hotel, and I couldn’t discern any odd changes of level or oddly positioned doors and windows. The spaces are impressive and the surroundings – marble fireplaces, dark woodwork and stained glass – add to the enjoyment of staying there. And the owners have taken care to preserve the electric-bell boards and the instructions for operating the original lift. I’m still wondering if the history of the building is even more interesting than it looks. This entry was posted in Fun Palaces, Norfolk's Seaside Heritage, Victorian Architecture on December 29, 2013 by Mike Higginbottom. Sometimes a man of talent is so attracted to a locality that he invests energy in one place that would otherwise have propelled him to wider fame. John William Cockrill (1849-1924) left his mark, quite literally, on the neighbouring resorts of Great Yarmouth and Gorleston. Indeed, Kathryn Ferry’s study of his work is entitled ‘The maker of modern Yarmouth…’. He laid out promenades at Yarmouth Marine Parade and in Gorleston, and designed the Gorleston Pavilion (1900), together with Yarmouth’s Wellington Gardens, which included an extensive shelter, seating up to seven hundred, and a domed bandstand built of Doulton columns and tiles. He was responsible for the innovative Wellington Pier Pavilion (1903), using Art Nouveau motifs in a way that prefigured the stripped modernism of inter-war architecture. It was built around a steel frame, clad in a patented fireproof material called Uralite, a brand-name which Punch thought hilarious. He also arranged to purchase the Winter Garden from the borough of Torquay, where it had made little profit since its construction in 1878-81, and to re-erect it – without breaking a single pane of glass – in 1904 beside the entrance to the Wellington Pier. His son, Ralph Scott Cockrill, designed the Yarmouth Hippodrome (1903) and Fastolff House, Regent Street (1908). If he had set his sails towards other spheres he could have commanded a much more remunerative position but he elected to stay in the place of his birth, because he loved the old town, which he helped to bring up-to-date, and abreast with many seaside resorts. Cockrill’s unbuilt schemes to turn the wooden jetty into Yarmouth’s third pier show flair and ambition to make even more of the resort: private enterprise might have made more of his talent, but he chose to remain a public servant in his home town. Cockrill may not have gained fame or fortune, but he deserves credit in Yarmouth for being the genius of the place. Kathryn Ferry’s study of J W Cockrill forms a chapter in her collection Powerhouses of provincial architecture, 1837-1914 (Victorian Society 2009), obtainable from http://www.victoriansociety.org.uk. This entry was posted in Fun Palaces, Norfolk's Seaside Heritage, Victorian Architecture on December 28, 2013 by Mike Higginbottom. The writer Clement Scott (1841-1904) first visited Overstrand by accident in 1883, staying with the local miller because there were no vacancies in Cromer. He was so attracted to the quiet North Norfolk coast that he described it in a series of romanticised articles in the Daily Telegraph and elsewhere. He called it “Poppyland“. Five years later, when land for development came on the market, Overstrand rapidly attracted some of the richest people in Britain – a small colony of bankers and lawyers, most of them Liberal in politics, cultured and socially extremely well connected. Part of its appeal was that it was not Cromer, by then regarded as popular, if not exactly vulgar. At one time there were six millionaires in the village – among them Cyril Flower, Liberal MP and later Lord Battersea, Lord Hillingdon, one of the few Tories in the village, and the financier Sir Edgar Speyer who became chairman of the original London Underground. Their holiday neighbours included Sir Frederick MacMillan, son of the founder of the publishing empire, Edward Lyttleton, headmaster of Eton, and the classicist Gilbert Murray. Though these incomers lacked the landed status of earlier generations of Cromer-based bankers, Barings, Gurneys and Hoares, they knew how to spend money and they had taste. 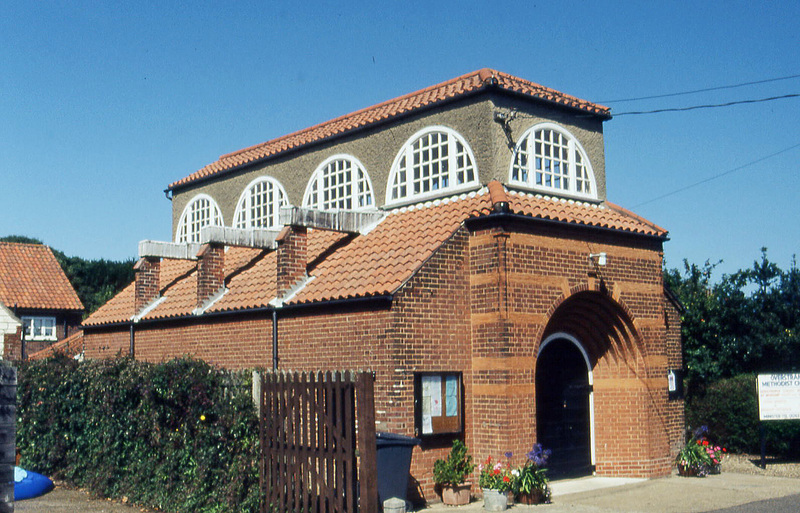 The rising young architect Edwin Lutyens received two domestic commissions in Overstrand, The Pleasaunce (1888) for Cyril Flower and Overstrand Hall (1898-1900) for Lord Hillingdon. Cyril Flower, as Lord Battersea, provided Lutyens with his only opportunity to build a Methodist chapel (1898). Celebrated visitors flocked to stay with such opulent hosts. Queen Alexandra visited the Hillingdons. Lady Randolph Churchill, often with her sons Winston and Jack, stayed repeatedly with either the Speyers or with the powerful lawyer Sir George Lewis, who lived in the Danish Pavilion, which he’d transported direct from the 1900 Paris International Exhibition. Sidney and Beatrice Webb stayed with Lord and Lady Battersea, whom they disliked, on a working break with their fellow Fabians, George Bernard Shaw and Graham Wallas. The heyday of Poppyland was all over so quickly, killed – as much as anything – by the effect of the First World War. After 1919 the millionaires moved away and died off, and by the mid-1930s all the major houses had been converted to hotels, nursing homes or apartments. By that time the only major modern hotel in the village, the Overstrand Hotel, was at risk of sliding over the fast-eroding cliffs: it eventually burnt down in 1947. Overstrand remains an attractive and interesting place to visit. It carries the implicit message that you can’t take it with you. The 44-page, A4 handbook for the 2011 Norfolk’s Seaside Heritage tour, with text, photographs, maps, a chronology and a reading list, is available for purchase, price £15.00 including postage and packing. To view sample pages click here. Please send a cheque, payable to Mike Higginbottom, to 63 Vivian Road, Sheffield, S5 6WJ. This entry was posted in Norfolk's Seaside Heritage, Sacred Places, Victorian Architecture on December 28, 2013 by Mike Higginbottom. Until 1877 Cromer was regarded as a “fashionable watering place”. Its attractions, for those who could afford to stay there, were the cliff scenery, the activities of the fishing trade, and the opportunity to bathe, either in the actual sea using bathing machines, or in bath houses. Through much of the nineteenth century Cromer remained a very small settlement, and much of the surrounding land remained part of the Cromer Hall estate. 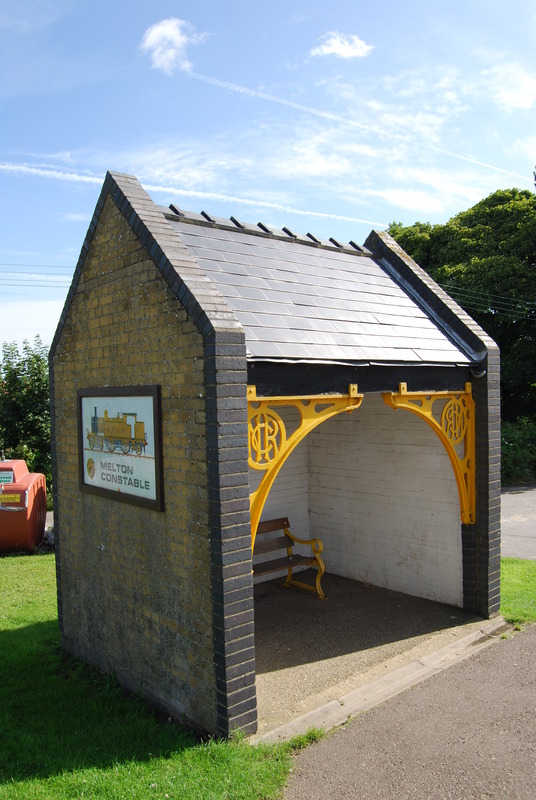 The East Norfolk Railway, first promoted in 1864, opened to North Walsham in 1874, to Gunton two years later, and eventually reached Cromer High Station, a mile away from the town-centre, in 1877. Ten years later the Eastern & Midlands Railway completed its branch from Melton Constable to the more accessible Cromer Beach Station in 1887. This provoked a carefully managed expansion of the little town, seeking affluent visitors in small numbers. A major contributor to this development was the ebullient Norwich architect, George Skipper. With his brother Frederick, he built the Town Hall (1890), followed by the restrained Grand Hotel (1890-1) on part of the Cromer Hall estate as the flagship development for the western extension of the town. It was demolished after a fire in April 1969. A different syndicate employed George Skipper to build the Hotel Metropole (1893-4, demolished 1970s), a more flamboyant design than the Grand, with oriel windows and Skipper’s favourite Flemish gables to enliven the roofline. Though the Grand and the Metropole have now both gone, Skipper’s Hotel de Paris, built in 1894 for the proprietor, Alex Jarvis, remains in business. A virtual rebuilding of a more reticent Georgian building that had been a private residence before it became a hotel in 1830, the Hotel de Paris is the prestigious embodiment of its proud name, with an asymmetrically placed entrance surmounted by a landmark domed tower. Enlivened by Skipper’s favourite material, terra-cotta, it is the most prominent and endearing building in Cromer. 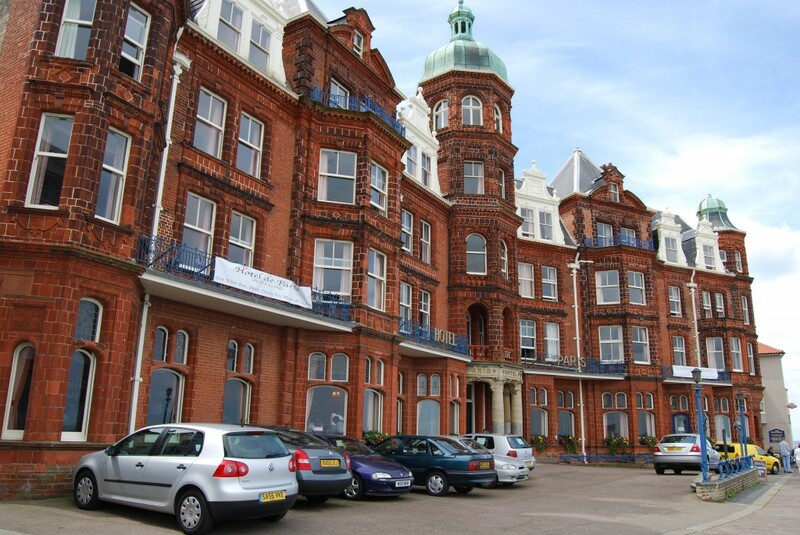 George Skipper’s final work in Cromer was the extension of the Cliftonville Hotel in 1898, providing a grand staircase and an elegant dining room that also remains in hotel use. The holidaymaker’s experience of the Norfolk seaside was, until the late 1950s, bound up with the eccentricities of travelling on the former Midland & Great Northern Joint Railway, one of the less likely networks to emerge from the idiosyncracies of Victorian railway competition. The East Anglian “main line” network was the Great Eastern Railway, fanning out from London Liverpool Street station to the major towns and cities – King’s Lynn, Hunstanton, Cromer, Norwich, Great Yarmouth, Lowestoft, Ipswich and Southend. Two of the Great Eastern’s competitors in the national network, the Midland and the Great Northern, recognised that by merging their interests in a string of cross-country lines into and across East Anglia they could reach ports and holiday resorts to capture freight and passenger flows into the Midlands and the North that the Great Eastern simply couldn’t deal with. They could also provide competing services into London’s King’s Cross, though that route was never as fast as the Great Eastern’s more direct routes. In 1893 the two companies set up a joint board, with equally shared rights and responsibilities, to manage their East Anglian operations. Over the following sixty-odd years, the M&GNJR struggled against two particular difficulties – an excess of single-track mileage (over 60%) and heavy gradients across the grain of the landscape. Normal services were laborious, and holiday specials spent much of their travelling time waiting in loops for approaching trains to clear the route – hence the popular nickname, “Muddle and Get Nowhere”. The line was distinctive as well as eccentric, and came to be much loved by enthusiasts. Its locomotives wore a golden ochre livery and its carriages were either built of teak or painted to look as if they were. Almost the whole of the M&GNJR network, nearly 200 miles, closed down peremptorily in 1959, years before Beeching. The line from Norwich to Cromer and Sheringham remains operational, and the North Norfolk Railway runs preserved steam and diesel trains between Sheringham and Holt [http://www.nnrailway.co.uk]. Otherwise, much of this extensive railway has completely disappeared – returned to farmland or woodland. The track between Cromer and Holt is all that remains of the M&GNJR network: https://www.youtube.com/watch?v=-WIYUJd4q80. Melton Constable, hub of the system with a four-way junction, workshops and workers’ housing, is no longer recognisable as the “Crewe of North Norfolk”. A couple of summers ago my friend Terry, who knows a thing or two about railways and lives near Holt, spent a baffling morning showing me what little remains of railway archaeology in Melton Constable. The most impressive relic is the bus shelter – not up to Ukrainian standards [see http://www.brama.com/travel/busstop.html] – but very dignified, with monogrammed ironwork from the station awning, painted in golden ochre. The monogram in the ironwork clearly has the letters CNR – Central Norfolk Railway – a company that never actually operated: the spandrels were cast in anticipation and reused by its successor, the Eastern & Midland Railway, itself an amalgamation formed in 1883. This entry was posted in Norfolk's Seaside Heritage, Transports of Delight on December 27, 2013 by Mike Higginbottom. I wish I’d had the opportunity to meet George Cushing. He was the man who made the Thursford Collection of showmen’s engines, fairground rides, mechanical organs and much else. He was the son of a farm labourer, born in 1904 in the village of Thursford, and left school at the age of 12 to work on the land. In the early 1920s he began driving steamrollers, and eventually bought one of his own with savings of £225. He clearly had a head for business: by the end of the 1930s he had a fleet of fifteen steam rollers and a steam lorry – all in practical use – yet realised that steam was on the way out. This appalled him: to discard steam was like selling the crown jewels for scrap, so he began to collect redundant steam engines – road rollers, traction engines and showmen’s engines. Steam enthusiasts made pilgrimages to Laurel Farm, and then ordinary tourists. He laid a car park, and built a gift shop and café. He had the combined flair of Fred Dibnah, a generation younger, and Harry Ramsden, a generation older. There is nothing quite like the Thursford experience. The crown jewel is the Wurlitzer from the former Paramount Cinema, Leeds (1932), which is played daily by the resident organist, Robert Wolfe. Alongside the organ is George Cushing’s huge collection of engines, mechanical organs and a Gondola switchback. 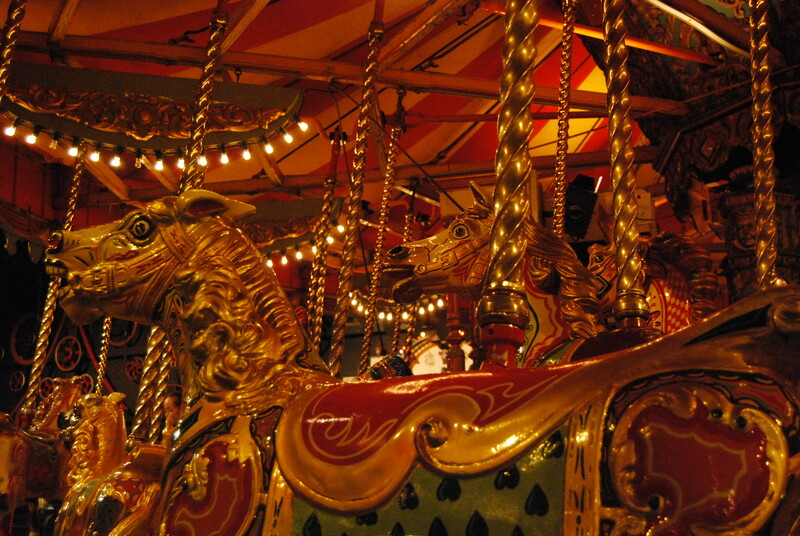 The shows are what theatre organ should be about – entertainment – and there are just as many children sitting spellbound and enchanted as there are senior citizens. Thursford has got it right. This entry was posted in Fun Palaces, Norfolk's Seaside Heritage on December 27, 2013 by Mike Higginbottom. There are two places in Britain where you can experience circus performed in a purpose-built building with a mechanism to convert the ring into a tank for water displays. One is, of course, the Blackpool Tower Circus [http://www.theblackpooltower.co.uk/index.php], which is famous for where it is and what it is; the other, a little less well known, is the Great Yarmouth Hippodrome [http://www.hippodromecircus.co.uk], which is unique in the way it belongs to, and continues to reinterpret circus and show-business traditions in exciting new ways. The owner of the Great Yarmouth Hippodrome, Peter Jay, is remembered by a certain generation as the leader of Peter Jay & the Jaywalkers, one-time support band to the Rolling Stones. He is in fact the descendant of one of Great Yarmouth’s showman families, married to Christine, who belongs to the other Great Yarmouth showman family. Peter told a Daily Telegraph reporter, “When we started going out, everyone thought we were just trying to find out each other’s family business secrets.” [December 6th 2008]. After Peter and his father first bought the Hippodrome building to forestall a rival bingo operator in 1983, they gradually realised the potential to develop creative, innovative circus entertainment within the old traditions of highly skilled, risky physical performance, using lighting, music and dancers alongside the acrobats, trapeze-artistes – and synchronised swimmers. 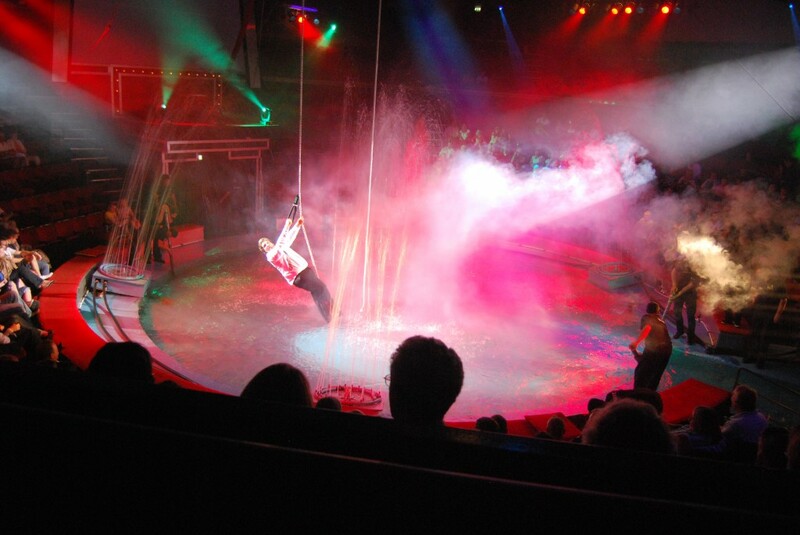 The swimmers are the most unusual part of the Hippodrome performance: as the second half of the show winds towards its finale, four pairs of stagehands unlock the bolts that hold the circus ring in place and it gently sinks into the water tank beneath. Once, you could see this in a number of places – the London Hippodrome on Leicester Square, the Olympia Theatre in the Liverpool suburb of Everton. Now only Blackpool and Great Yarmouth operate in Britain, and two others – Moscow and Las Vegas – elsewhere. Several of Peter and Christine’s sons have been directly involved in the present-day show – Ben as the lighting designer, Jack as co-producer and drummer; Joe, a trained trapeze artist, prefers to work on oil-rigs and other high-building sites. In fact, one of the joys of working in circus is the way the whole troupe forms a family for the duration of the run. Watching live circus is an inimitably thrilling experience. Some people are intimidated by the level of risk that the artistes take on; for most audiences, that is the sheer wonder of circus. There are no special effects, though there is certainly a dash of conjuring in the clowning. The precision, precariousness, athleticism, grace and beauty of the acrobatic acts is unique to this form of entertainment. Actually, I don’t miss the animals.